A Christmas Bird Count Without Birds? Yesterday afternoon, I found an adult Lesser Black-backed Gull along the edge of the artificial pond at Donaldson Park. At first it stood in the shallow water, and then it moved up onto the bank and stood there for a while. The mantle was clearly slate-gray, and its legs were obviously yellow in the afternoon sunlight. Light streaking on its crown and nape also indicates its identity. Oddly enough, there were no Great Black-backed Gulls present, or at least none that I saw. However, there were Herring Gulls and Ring-billed Gulls. This was a nice sighting to close out my county birding year. California may list the Black-backed Woodpecker as a threatened species. While the species is not endangered on a continental level, it is rare in that state, and its habitat is subject to intensive logging. Biologists are studying the Red Knots that winter along the Gulf Coast to assess whether that population is stable. Here is a map of this winter's Snowy Owl irruption, via eBird and BirdsEye. Scientists are studying hybridization patterns between Gambel's and Elegant Quail. The Bureau of Land Management is proposing to create wind development zones to reduce impacts of wind energy on birds and bats. A Blog Around the Clock: The wonderful quail…and what Sen.Coburn should learn about it. When a gray wolf wandered from Oregon into California this week, it became the first wolf recorded in California since 1924. The wolf's movements are being tracked with a radio collar. Since gray wolves were reintroduced to Yellowstone National Park in the 1990s, elk and coyote populations have declined, while aspen, willow, and cottonwood trees have bounced back. The beaver population has also increased. The Delta of the Sacramento and San Joaquin rivers has been healthier this year thanks to above-average rainfall. A new study argues that beavers shaped much of North America's landscape. Newly-released satellite imagery shows the development of tar sands mining in Alberta, Canada. Like adult butterflies, caterpillars also engage in mimicry to appear similar to species with chemical defenses. A federal judge has blocked California's low-carbon fuel law, which was intended to help the state meet its goals for greenhouse gas reductions. Madrid has created a new six-mile-long park to rejuvenate a stretch of the Manzanares River and reconnect city neighborhoods that had been cut off from each other by a freeway. The project included digging tunnels to bury the freeway. Bunker fuel spilled into San Francisco Bay during the Cosco Busan accident in 2007 was particularly toxic to the bay's herring population, which is important for seabirds and other marine predators. Two of the ubiquitous species in my area during the winter months (well, year-round, really) are the House Finch (above) and House Sparrow (below). Oddly, neither of these species is native to this area. The House Finch is a western species. Its eastern population grew from birds that escaped from the pet trade. The House Sparrow population grew from a series of deliberate releases in the 19th century. Birding in Johnson Park is usually an opportunity to observe the strange forms that result from domesticating waterfowl, and Monday was no exception. The bird above looks like the product of a Canada Goose interbreeding with a domesticated goose, probably a Greylag. This goose looks a bit different from the Canada X Greylag crosses that I normally see because of its mostly white face and white belly band. Greylag still seems like the most likely candidate based on availability. This duck is one of many Mallard domestic breeds. It looked larger and bulkier than the wild Mallards nearby. Yesterday was the Raritan Estuary Christmas Bird Count, my local CBC. As in past years, I participated along with my mother and sister, and we worked a section of the count circle that includes my patch, as well as a few other locations. Unfortunately, the birding yesterday was as slow as I have ever seen it in my area. Even Canada Geese and gulls, two mainstays for my area, were relatively few compared to past years. Common land birds were sparse as well; we only recorded four American Robins in the course of the day. The highlights for the day were all in Johnson Park. They included a Wood Duck and two Common Goldeneye on the river, a Bald Eagle that flew overhead, and a Yellow-bellied Sapsucker across River Road from the tennis courts. Also in Johnson Park, a Cooper's Hawk was harassing a Red-tailed Hawk. In Donaldson Park, I noticed that some of the Canada Geese were harassing a European Starling. I would have thought that a starling would be too small for the geese to care about it, but these geese were very aggressive. The count ended with 41 species and about 2,900 individual birds for our section. One common fern from eastern North America is the Christmas fern (Polystichum acrostichoides). Christmas ferns stay green year-round, even through the coldest parts of winter. Because of this and their tolerance of multiple soil conditions, Christmas ferns are popular as ornamental plants. In the wild, this fern is partial to upland woodland, particularly rocky soil and wooded slopes. When the fields at my patch get wet from rain or flooding (or both), the puddles become a foraging area for waterbirds. Yesterday a group of Ring-billed Gulls were loafing and foraging in one of the wet fields near the pond. Here are a few of the birds. Scientists are urging that at least one third of "forage fish" like anchovies and herring be left for seabirds to eat. The high commercial demand for "forage fish" is starting to put seabird populations such as gulls, kittiwakes, terns, puffins, and penguins at risk. When Lesser Kestrels and Jackdaws breed in mixed colonies together, they keep a truce of sorts: the Lesser Kestrels help protect the Jackdaw nests, and in return the Jackdaws do not prey on the Lesser Kestrels' eggs. A study in Oregon found that thinning forests to give them old-growth characteristics (and thus make extra habitat for Spotted Owls) chases out flying squirrels, the Spotted Owl's primary prey. A pair of Whooping Cranes are wintering in western North Carolina. The captive Spoon-billed Sandpipers that were taken to the U.K. are now out of quarantine. 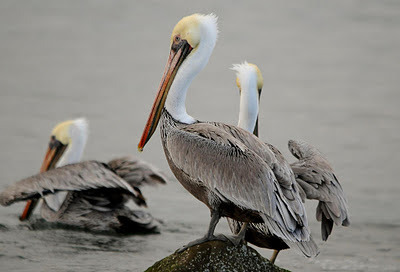 Laelaps: Why Is a Pelican Like a Whale? 10,000 Birds: Merry Christmas Shearwaters! Not Exactly Rocket Science: Why aren't all chilies hot? November 2011 was the 12th warmest November on record. The EPA's new mercury rules became final this week. Unlike past rules, the current rules will cover mercury sources like aging power plants that were grandfathered under the Clean Air Act. These plants will either need to come into compliance or shut down. Over 40,000 Monarchs were counted wintering at Ellwood Mesa in California. Some winter nature photos in honor of the solstice included this snowy landscape from the Sierra Nevada and pronghorn running in the snow. Here is a Christmas-themed gallery of insects (mostly multicolored beetles). Brown-headed Cowbirds are well-known among birders for parasitizing the nests of other songbirds, particularly sensitive species like Kirtland's Warbler. Nest parasitism, in this sense, means laying eggs in the nests of other songbirds for the host birds to incubate and feed. Such nest parasitism puts pressure on the host species, but scientists studying Chalk-browed Mockingbirds (Mimus saturninus) and Shiny Cowbirds (Molothrus bonariensis) in South America have found an unexpected benefit. Shiny cowbirds regularly visit mockingbird nests and attack and puncture any eggs they find there -- damaged eggs are later removed by the mockingbird host. During these visits cowbirds will often lay their own eggs in the nest for mockingbirds to hatch and bring up alongside their own chicks. Whilst mockingbirds will mob an attacking cowbird, once an alien egg has been laid in their nest they will usually accept it -- even though it looks very different from their own eggs. The researchers recorded video of 130 cowbird visits to see what happened to the eggs in mockingbird nests over three breeding seasons. They experimentally manipulated clutch compositions to compare host egg survival in clutches with different numbers of cowbird eggs. They found that mockingbird eggs were more likely to survive a puncture attack when more cowbird eggs were present in the nest. Computer simulations showed that this is likely to be a widespread phenomenon, and that, paradoxically, the greater the local density of parasites, the stronger the benefit hosts get from the presence of parasite eggs. It would be interesting to see if this applies to parasite-host relationships elsewhere as well. One of the great things about birding is its capacity for surprise. No matter how much you may think a bird might be a given species, it is always worth a closer look because it could be something else. Yesterday as I was walking through my local patch, I saw large numbers of the usual waterfowl like Canada Geese and Mallards. Across the river were some small, very white ducks. At first, I though they were probably Common Mergansers since those are usually present along this stretch of the river from December through March and even April. However, I checked more closely, and they turned out to be Common Goldeneye, a less common species for the site. It was hardly a rarity, but it was still a present surprise and a reminder of the importance of testing assumptions. At one time or another, we have probably all seen a bird hampered by fishing line, with the line wrapped around its legs or tangled elsewhere on its body. This is a widespread problem, especially since plastics line fishing line persist in the environment. The problem is not new — or limited to Prospect Park. Birders in other city and state parks report similar cases. The Ocean Conservancy in Washington points out that monofilament fishing line, which is made from an individual fiber of plastic, has been in use since World War II, and as the decades pass, it has accumulated in the water and on land. For a quarter-century, the conservancy has organized coastal cleanups throughout the world on a single day in September. Over that time, 1,340,114 pieces of discarded fishing line have been collected, according to the group. Birding groups and wildlife experts say that most fishermen and women are quite likely unaware of the impact on wildlife. The solution, they contend, is more education, as well as the availability of secure receptacles for old fishing line and hooks. Open trash cans easily overflow, they say, and the wind blows the line away. Yesterday morning I birded two sites in South Amboy, the mudflats at Morgan Avenue and Waterworks Park. At the first site, there were a large number of the expected gull species loafing on the sandy spit or resting in the bay. As I was looking through those, a flock of Brant flew in and landed nearby. They proceeded to act as Brant normally do until the flock got spooked and took off. Some American Black Ducks and Red-breasted Mergansers were present further out in the bay. Very few land birds were evident at either site. The pond at Waterworks Park had more waterfowl, chiefly a flock of Canada Geese and about 35 American Coots. I had not seen that many coots in a while, so it was fun to watch them. They were particularly active and vocal yesterday. Out in the middle of the pond, there was one duck that took me a while to identify. Eventually I settled on female Redhead, but I was left with a little uncertainty. I find it much easier to identify Aythya ducks when there are in a group and individuals can be compared with each other. Both photos show the same individual, but the color looks different in the second because the direction of light changed. Finally, here is a view out into Raritan Bay at the end of Cliff Avenue. Fossil feathers found among fossilized ibis remains give a sense of how the birds lived and looked. Though the birds were flightless, their feathers show adaptations in common with relatives that are able to fly. Some feathers were dark brown or black while others were light brown or white, suggesting that the ancient ibis may have looked something like an immature White Ibis. The American Bird Conservancy is asking the Department of the Interior to develop regulations to govern how wind farms affect birds and other wildlife. Ostriches and emus are among the few birds that have a phallus; unlike mammals but like other birds, the erection mechanism is lymphatic fluid rather than blood. A British birdwatcher did not like the movie version of The Big Year. Sparrows exposed to the threat of predators produced fewer offspring than those that suffer less of a threat. Scientists have discovered new breeding sites for the rare Black-throated Robin in central China. 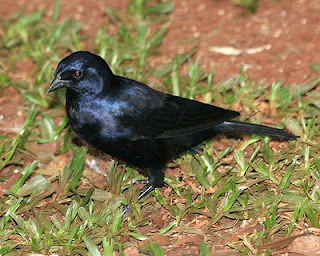 The species is related to the European Robin but looks a lot like North America's Black-throated Blue Warbler. At least 1,500 Eared Grebes were killed when they got confused during a storm and collided with a parking lot. Most likely they mistook the dark asphalt for water. British police caught an egg collector with over 700 wild bird eggs in his home. Tinton Falls, New Jersey, is looking for a way to rid themselves of the large number of gulls that are attracted to a nearby landfill. A photo of King Penguins won the first Mongabay.com photo contest. Sierra Leone is trying to attract birdwatching tourism. 10,000 Birds: Why is the Robin’s Breast Red? A research team has found more than 1,000 new species in the Australian outback, and there may be thousands more waiting to be discovered there. Scientists found 208 new species in the Mekong Delta just in the past year. Two newly-discovered frogs from Papua New Guinea are the smallest known tetrapods. The frogs are 8-9 mm long. Here is a look back at some of the scientific research done at Antarctica since Amundsen reached the South Pole 100 years ago this week. A fossil squid had complex eyes with 16,000 lenses per eye. A newly-discovered species of tree frog has complex vocalizations that sound more like a bird than typical frogs. Scientists have found a new species of pit viper in Tanzania but are keeping the location secret because of the viper's rarity. A few vipers have been collected to start a captive breeding program. It is no secret that the Endangered Species Act gives incomplete protection to vulnerable species in the United States. Not all vulnerable species are listed, and even when a species is listed, a recovery plan may take years to create or lack adequate funding. A new study attempts to quantify just how many species lack Endangered Species Act protections. The study has found that of the American species included on the IUCN Red List, 40% of birds, 50% of mammals, and 80-95% of other species such as amphibians, gastropods, crustaceans, and insects, were not recognised by the ESA as threatened. The locust trees that I like so much are mostly bare, aside from a few stray seed pods. Even in winter, though, their crooked branches make the trees visually interesting, both in small details like above and in wider views like the ones below. These white bracket fungi covered the side of a tree at the Great Swamp on Saturday. Since I am a novice at identifying fungi, I am not going to venture a guess as to what they are. Rains last week left large puddles at my patch for these Ring-billed Gulls and Canada Geese to bathe in and drink. Yesterday I was at the Great Swamp NWR. There was very little visible or audible bird activity while I was there. In fact, there were not even many waterfowl, which is what I had hoped I might see there. So instead of looking at birds, I found myself looking at reflections in the water. 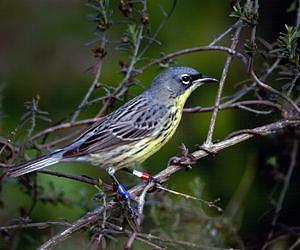 One of the early conservation challenges in rebuilding the Kirtland's Warbler population was providing sufficient nesting habitat. These birds nest in jack pines that are five to fifteen feet tall – in other words, very young forests. Jack pines need fire for their seeds to germinate, so stands of young jack pines are relatively uncommon in a context where forest fires are carefully controlled. Fortunately, conservationists found ways around this problem, and the Kirtland's Warbler population has recovered steadily since its nadir. An interesting finding is that Kirtland's Warblers prefer young, disturbed forests on their wintering grounds as well as their breeding grounds. 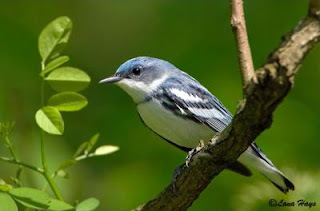 What the scientists discovered was that, like in their summer homes, Kirtland's warblers are found in young forests. On Eleuthera, these forests only occur after a disturbance of some sort - like fire, clearing for agriculture, or grazing. And grazing turns out to be a disturbance the warbler can live with just fine. Old forest whose underbrush has been munched on by goats provides the most suitable habitat for warblers, said Helmer. The results, published in this month's issue of Biotropica, suggest that goat grazing stunts the forest regrowth, so that the tree height doesn't exceed the height beyond which important fruit-bearing forage tree species are shaded out by taller woody species. 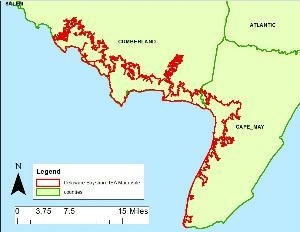 Helmer said that understanding how and where the warbler's winter habitat occurs will help conservation efforts in the Bahamas. Helmer said that a unique feature of warbler's winter habitat is that the age of this forest correlates very strongly with its height. Birders on San Clemente Island off southern California found a Red-flanked Bluetail, a very rare bird for North America. 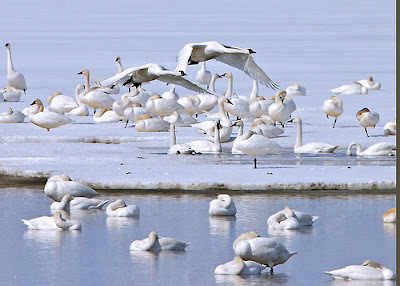 The species breeds in Siberia and winters in southeast Asia. Sixteen captive-bred Whooping Cranes arrived in Louisiana as part of the attempt to reintroduce a third Whooping Crane population there. Penguins may time their dives according to the work their muscles are doing. The average penguin flaps its wings underwater 237 times in between breaths at the surface. A Critically Endangered ibis species was found in Cambodia for the first time in almost a century. This species, the Giant Ibis (Thaumatibis giganteawas), is believed to have only 100 breeding pairs in the world. A new conservation reserve at Volcan Antisana in Ecuador is home to numerous sensitive species, including Andean Condor (Vultur gryphus), Silvery Grebe (Podiceps occipitalis), and Black-faced Ibis (Theristicus melanopis). According to a study using geolocators, South Polar Skuas follow a similar figure-eight migration pattern whether they spend the Antarctic winter in the North Atlantic or North Pacific. Energy utilities have decided not to build a wind farm in a key breeding area for Marbled Murrelets. The Bureau of Land Management as created a new conservation strategy for the Greater Sage-Grouse and will implement in cooperation with the U.S. Forest Service. Scientists studying seedeaters in South America believe that the birds may be in the midst of evolving into separate species because they differ widely in plumage and song but not in genetics. Almost 140 Greater Flamingos were killed when they flew into a power line in western India. Bourbon, Bastards, and Birds: The Human Birdwatcher Project Presents: Birding By Yourself - A Lonely And Embarrassing Habit. Global emissions of carbon dioxide rose by the highest amount on record last year. Scientists rediscovered the rare Cockerell's bumblebee in New Mexico; the species was last recorded in 1956. A new report found that three-quarters of butterflies in the U.K. have declined in population and half have more restricted ranges compared to a decade ago. Meanwhile, several butterfly species found in North America's Pacific Northwest are likely to become extinct in the near future. New research has turned up additional evidence that the Mayan civilization collapsed because of deforestation that led to declines in precipitation accompanied by severe droughts. New York purchased a 1,200-acre parcel of forested land in the Catskills to protect New York City's watershed. Mongabay.com has been posting photos of amphibians this week, including a blue-and-yellow poison frog, two tiny newly-discovered frogs, and a red-eyed tree frog. New Jersey's Delaware Bayshore has now been designated as a Globally Significant Important Bird Area. To achieve the “Globally Significant” label, [New Jersey Audubon] and National Audubon submitted years of annual shorebird and waterfowl survey data to a panel of nationally and internationally recognized experts. The panel found that four species were present in numbers that met or exceeded the quota required to trigger the “Globally Significant” designation: The Bayshore is a crucial stopover site for migrating Red Knots and Ruddy Turnstones, and provides critical winter habitat for large concentrations of Snow Geese and American Black Ducks. The survey data was collected in annual surveys by wildlife biologists from the New Jersey Department of Environmental Protection (NJDEP). Of the four species named in the Globally Significant announcement, the plight of the Red Knot and Ruddy Turnstone is the best known and lends a bittersweet note to the designation. While recent surveys show significant numbers of birds refueling at the Bayshore during spring migration (12,000 to 16,000 Red Knots and 17,000 to 37,000 Ruddy Turnstones), they are lower than numbers of 95,000 Red Knots and 80,000 Turnstones recorded in the early aerial surveys. A precipitous decline in these populations began in the mid-1980s, when horseshoe crab harvesting rose dramatically for use as bait. The horseshoe crabs’ eggs are essential food that allows these long-distance migrants to make it to their summer arctic nesting grounds to breed. I am actually surprised that this area was not designated as an Important Bird Area sooner since the importance of the area for migratory shorebirds (especially Red Knots) has been known for some time. Much of the area is already protected, so I am not sure whether this designation will lead to further conservation measures. Amidst the talk over the recent movie based on Mark Obmascik's The Big Year, a birder named John Vanderpoel is doing an ABA big year and compiling some impressive numbers. 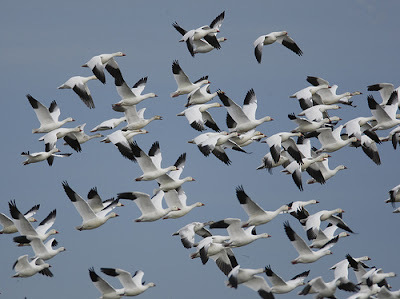 John W. Vanderpoel, who now lives in Colorado, has spotted 736 species of birds in 2011. That means he has the second-biggest Big Year ever. He trails only Sandy Komito of New Jersey, who logged 748 species in 1998. The 62-year-old Vanderpoel passed Virginia birder Bob Ake, who had 731 species in 2010, for second place. He is only the 15th birder in the United States to log 700 species on a Big Year. Topping 700 made him “happy and humble,” he wrote on his Big Year blog. He said his goal was to get to 700 species, not to set the record. In fact, he was the quickest Big Year birder to reach 700 species. He has also seen 911 species of birds, mammals, reptiles and amphibians in his travels. His goal: 1,000. Will he reach Komito's record? At this point it seems unlikely that he will pick up the 12 species he would need to tie the record (or the 13 to break it), but it is still possible. You can follow the rest of his big year on his blog. As I was walking around Donaldson Park (my patch) yesterday, I saw a Mute Swan on the park's pond. Mute Swans are not uncommon in New Jersey. In fact, they are very common in certain locations like Cape May or the Meadowlands. However, this was only the second time I have seen one on my patch (the first time was last Sunday). Since it was foraging close to the edge, I stopped to take some photos. A few weeks ago, a Snowy Owl was reported at Merrill Creek Reservoir in Warren County, New Jersey. If current trends continue, it may turn out to be part of the vanguard in a Snowy Owl irruption year. That aside, it has stuck around for a few weeks and has been seen by numerous observers. Yesterday, I finally got a chance to visit the reservoir and see it. Normally, when I visit Merrill Creek, I prefer to stay in the wooded wildlife sanctuary on the north end of the reservoir, but yesterday I decided to walk all the way around to see the owl and look for any waterfowl that might be hanging around the edges of the reservoir. As you can see from the photo, I was successful in finding the Snowy Owl. Thanks to some directions posted on Friday on Jerseybirds, the owl was fairly easy to find. The owl is visible from the top of the main dam, on the south side of the reservoir. The dam is very high, so a scope will give better views, but I was able to see the owl and watch it turn its head back and forth just with binoculars. The rest of my walk was fairly quiet, with only a few bird flocks here and there. I saw a lot fewer waterbirds than I expected: only about two dozen Buffleheads and a half dozen Horned Grebes. It felt a little strange to be walking around a body of water with no Canada Geese or Mallards visible. Land birds were also a little sparse. The highlights were a couple of calling Hairy Woodpeckers and a pair of Eastern Bluebirds. Somehow, though, I managed to add 13 species to my bird list for Warren County. On Thursday, I had a chance to see a bird that has been on my wishlist for a while: a Greater White-fronted Goose. This was one of the last waterfowl missing from my lifelist that I could see in the eastern United States. I had attempted to see it on a few other occasions in a few other places but missed each time, often getting there a day or two after the last known sighting. 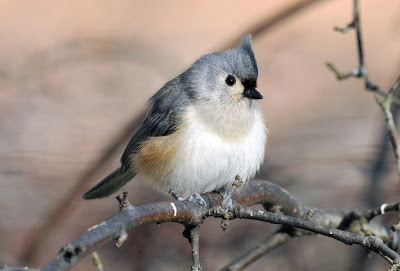 Early this week, I found out about one that had been observed at Duke Island Park, a small park near the confluence of the North Branch and South Branch of the Raritan River. So on Thursday I went out to see it. As it turned out, this turned out to be one of the easiest life birds I have ever looked for. The Greater White-fronted Goose was associating with a large flock of Canada Geese, and on Thursday morning, the flock was in the park's small pond. The Greater White-fronted Goose was on the side of the pond closest to the parking lot, so I had spotted the bird within five minutes of arriving. It stayed on that side of the pond for the entire time I was there, so I had plenty of opportunity to watch and photograph the goose. Greater White-fronted Geese breed in the Arctic. Most winter in western North America and eastern Canada, but a few show up in the eastern United States each winter. These geese are slightly smaller than Canada Geese and resemble Greylag Geese, which provided the ancestral stock for most domesticated barnyard geese. They are recognized by their distinctive bright orange bill with a white vertical stripe at the base of the bill. They also have black barring on their breasts, but that field mark was mostly not visible on this bird since it was sitting in the water. In the photo above, you can see one of the black bars poking just above the waterline. The rest of the park was pretty quiet. On the road leading from the park commission building to the dam, I saw a half dozen Eastern Bluebirds, two Yellow-bellied Sapsuckers, and three Yellow-rumped Warblers. Other characteristic winter birds were present, like White-throated Sparrows and Dark-eyed Juncos. One Blue Jay was making some odd noises that sounded more like chirps than like the typical Blue Jay calls. (Now that I think of it, I probably should have tried recording its vocalizations.) I was surprised to see two Orange Sulphurs, one of which is in the photo above. I had not seen any butterflies in a while and figured that they had been killed off by recent cold weather.